We’re proud to offer comprehensive support for our pressure injection cells. Want a tutorial on how to pack a capillary column? Watch this great explanation at Benchfly by Dr. Charlie Knutson at MIT. What accessories do I need to use Next Advance Pressure Injection Cells? What if I live in a metric country and I want to use my own stainless steel tubing? You will need to purchase ADPT-3mm1/8 which mounts to the Pressure Injection Cell and accepts 3mm outside diameter tubing. What if I live in a metric country and I want to use TBNG10 (1/8th inch tubing) and a pressure regulator from my own country? You will need to purchase ADPT-ISO which threads into ¼ ISO fitting (metric) on the pressure regulator and accepts 1/8th inch tubing. What if I live in a metric country and I want to purchase the PACK-KIT? 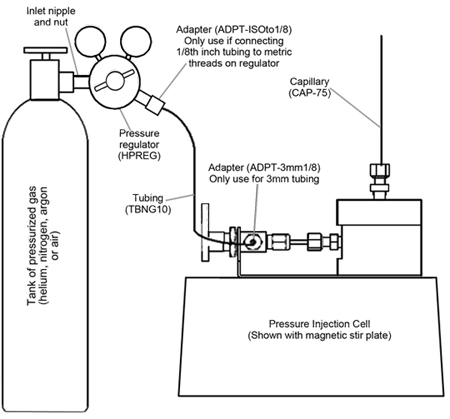 You will need an adapter between their pressurized gas tank and the pressure regulator regulator (HPREG). Every country has its own standards for the fittings on gas tanks, and in some countries it’s not even standardized. Customers should tell their local gas tank supplier that our regulators come with a CGA 580 fitting mounted in a 1/4 NPT threaded hole and the supplier can supply the correct fitting or adapter. Does the Pressure Injection Cell require electrical power? No. The liquid sample is forced through the capillary using pressurized gas typically supplied by a tank. Models with an integrated magnetic stirplate require electricity. They use a small power supply that plugs into a wall outlet. We supply the correct plug for your country. Which gases can it use? The choice of gas is not critical. Most customers use inert gases such as helium, nitrogen or argon. Dry air is fine too – if you purchase an adapter, NIP-AIR, to interface the tank with the pressure regulator. If you’re operating the pressure injection cell with inert gas in the United States or other country using English parts and CGA fittings (580 for inert gases), you do not need any adapters. If you will use metric stainless steel tubing, you will need an adapter, ADPT-3mm1/8 to mate the 3 mm tubing with the 1/8 inch fitting on the pressure injection cell. This can be factory installed or installed in the field. If you will use 1/8 inch stainless tubing with a regulator with metric or ISO fittings, you will need the adapter, ADPT-ISOto1/8. To use our regulator (HPREG) outside of the United States, you may need to purchase an adapter from your local gas supplier; they will know which fitting you will need to mate with our CGA 580 fitting. With multiple standard fittings in many countries and so many different standard fittings, we cannot be certain which fitting you will need. I want to fill my capillaries with a certain solvent. How do I know if it is compatible with the components of the pressure cell? The pressure cell should be compatible with most solvents. In theory, the solvent will only contact your sample tube and the capillary. Here is a list of other components that may come in contact with the solvent. Loading samples into a capillary for mass spectroscopy typically requires 100 to 400 psi. Packing capillary columns typically requires 500 to 1000 psi. Do I need a special pressure regulator? Most pressure regulators for gas cylinders have a maximum working pressure that is too low for packing capillary columns. We sell a higher pressure regulator, model HPREG, that has a working pressure up to 1500 psi, which is ideal for packing standard length capillary columns. How can you determine the approximate flow rate through a capillary? If the solution is flowing only through an otherwise empty capillary tube, the flow rate is straightforward to calculate. However, a frit or a packed capillary typically causes much more flow resistance, so it is best to measure the flow rate with a test solution. To measure the flow rate, run a test solution through a sample capillary and at the outlet place a calibrated micropipette. The solution should wick up the micropipette on its own so you don’t need any special fittings to seal them together. For example, Drummond and other brands of micropipettes, available from most laboratory product suppliers, come in 1, 2, 3, 4, 5, 10, 20, … µl volumes. Using a stopwatch, measure how long it takes from when the solution starts to exit the capillary and begins filling the micropipette until the micropipette is filled. How do I use the FRIT-KIT? For information on how to make a frit, please see the user manual. Can the pressure cell be used to extract compounds using supercritical CO2? The pressure cell can be adapted for this purpose. Please contact Next Advance technical support for additional information. The three bolts may not be fully tightened or the O-ring may be nicked, dirty or missing. If the O-ring is dirty, wash it off with a soap and water and return it to its groove. Contact us for a replacement O-ring. The ferrule should be replaced. Check that the gas tank is supplying the desired pressure (typically on the order of several hundred psi) and that the 3-way valve knob is pointing toward the pressurized gas line. When you are finished packing the column, turn off the pressure at the gas tank and let the column sit overnight so that the pressure in the cell leaks out through the packing. This avoids pull back of the packing media. There might be a small particle in the valve. Try blowing air through the valve while rotating the knob. The packing around the valve might not be as “tight”, i.e. the nut might have come loose. Remove the black handle – using a hex wrench to loosen the set screw holding the handle in place. You will then see a nut. Check that it is tight. Then replace the handle.